You might be a die-hard turkey fan at Christmas, but this year I'm going to do something a little bit different. 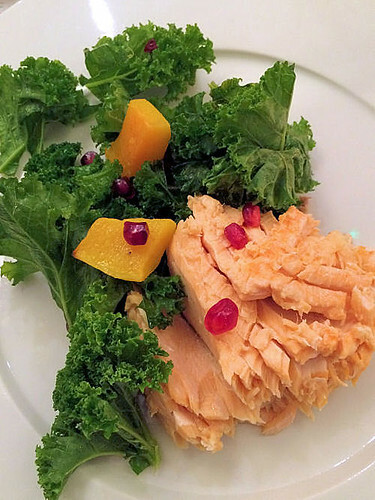 For Boxing Day lunch, I'm going to make a wonderful traditional Norwegian baked salmon, with a festive winter kale, roasted butternut squash, and pomegranate salad on the side. 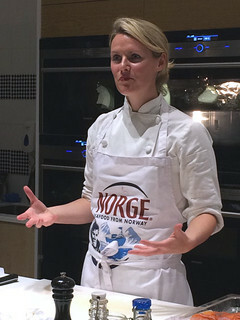 The other week, I attended a special event hosted by leading Scandinavian chef and author Signe Johansen, who has partnered with the Norwegian Seafood Council. 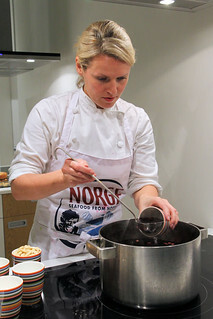 I came away full of recipe ideas and also learnt a lot about Norwegian salmon, which is harvested from strictly regulated farms that are spread throughout the cold, clear, coastal Norwegian seawaters, assuring a year round supply. Salmon is becoming increasingly popular as it makes a lighter, tasty alternative to the traditional roast. Norwegian salmon has a rich, smooth, fresh flavour, turning a delicate pink colour when cooked, with succulent defined flakes. 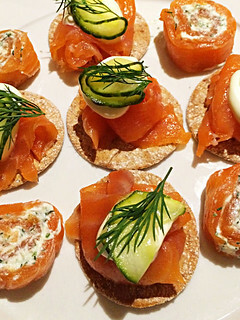 After arriving at the beautiful Scandi-styled Aveqia, we were greeted with some delicious smoked salmon canapés. There were baby smoked salmon roulades, filled with a dill, lemon and horseradish cream cheese filling, and smoked salmon on tiny crispbreads, topped with crème fraiche and pickled cucumber. The canapés went down a treat, the perfect little nibbles to eat, whilst chatting with some of the other guests, including a few of my food-blogging friends. Moving into the main area, which had a well equipped demonstration kitchen and a long Christmassy decorated dining table, we met Signe who showed us how to make a Scandinavian 'open' sandwich - a smørbrød. 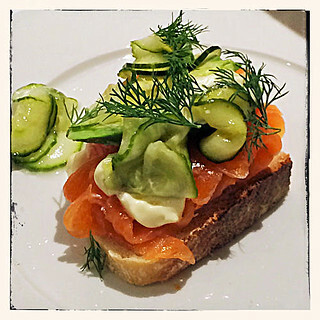 Then we had a go at making our own, starting with a toasted sourdough bread, which was topped with generous amounts of smoked salmon, avocado slices, crème fraiche, pickled cucumber and dill. These were similar to the canapés but larger and more substantial. 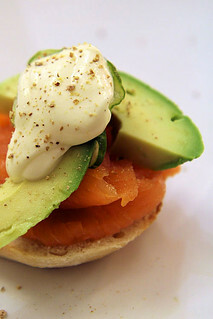 I heard someone say he had totally fallen in love with smoked salmon after trying this Norwegian salmon, and was planning to make the smørbrød for his lunch! 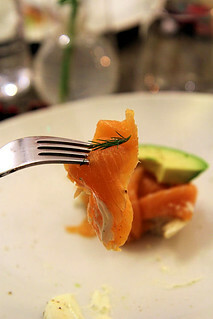 The main event was the show-stopping whole baked Norwegian salmon. Taking just 5 minutes to prepare, it was stuffed with onions, lemons, carrots and herbs, then covered and roasted in the oven for 1½-2 hours. 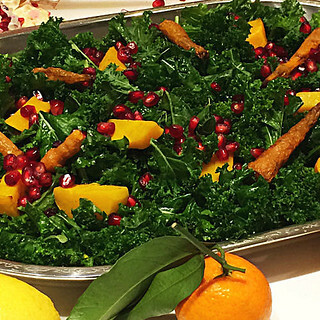 The accompanying kale, roasted butternut squash, and pomegranate salad (lovingly dressed with lemon juice and olive oil) was fresh and light. I'm thinking a few buttered new potatoes on the side would complement the salmon and salad really well. The meal ended with a Fyrstekake, a Norwegian almond and cardamom spiced tart, and a warming cherry glögg - made from cherry brandy, red wine and spices. 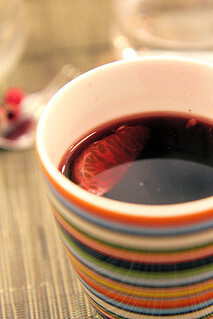 There are fresh clementines and roasted almonds at the bottom of the warm cherry glögg! 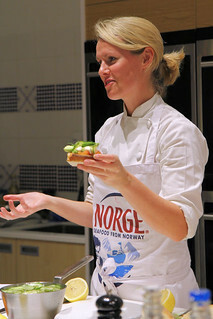 Recipe with kind permission from Signe Johansen for the Norwegian Seafood Council. You will need an oven large enough to place the butternut squash on one level and the salmon on another. Alternatively, you can choose to cook the butternut squash first and then follow this with the salmon if your oven has less capacity. You will need two long sheets of extra-strong aluminium foil a roasting tray. Butter both sheets to avoid the fish sticking. Place one sheet on top of the roasting tray and season with herbamare and pepper. Wipe the salmon dry and make three incisions into each side of the salmon. Stuff all six incisions with a piece of red onion, lemon, fresh parsley and carrot. Close the salmon and sprinkle with a little lemon juice to taste. Place the second sheet of foil on top of the salmon and crimp the edges inwards to create a parcel. Once sealed, place the salmon in the oven and roast for 1½ - 2 hours. For the butternut squash, kale and pomegranate salad. Chop up the squash into bitesize chunks, place them on an uncovered tray and place in the oven. Allow 30 minutes for the squash to roast in the oven. Once the butternut squash is cooked, remove from oven. 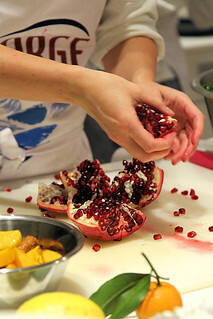 Finely chop the kale and add this to the pomegranate seeds. 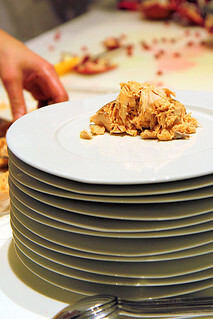 Toss together, cover and set aside until the salmon is ready to be served. Garnish the salad with the roasted butternut squash. 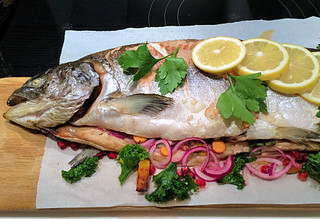 Once the salmon is cooked and ready to serve, remove the top foil from the roasting tray and simply move a whole fish onto a presentation plate or board to place at the centre of the table. 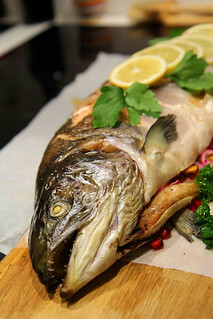 To serve, gently scrape off the skin (and assorted cooked vegetables from the incisions) and start portioning up the fish. Serve along with the salad and buttered new potatoes. Norwegian salmon is available at supermarkets and fishmongers, look for regular great value offers. 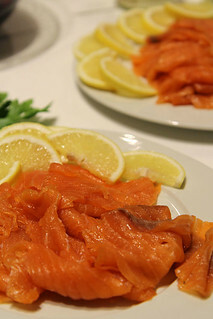 For more salmon recipes and information on the Norwegian Seafood Council, have a look at their informative website. They are also on Twitter @norwayseafood. 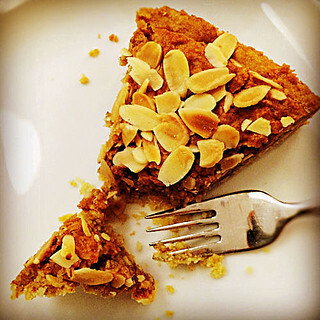 Signe Johansen is on Twitter and Instagram, and has written several Scandinavian cookbooks. Disclosure: I was invited to attend the event by the Norwegian Seafood Council. All views are my own. 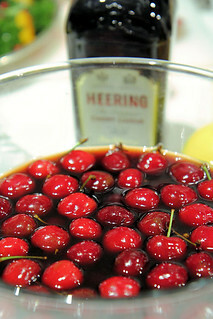 The recipes sound great, in particular the cherry glogg!